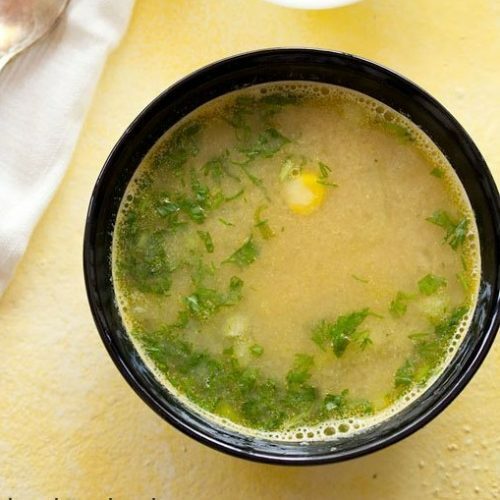 thin light indian style soup made with sweet corn. steam or pressure cook 1 medium to large corn cob. you can steam the sweet corn cob in a steamer or a pressure cooker. if pressure cooking, then pressure cook for 2 to 3 whistles in 1.5 cups water. you can also use 1 cup of tinned corn kernels. when the corn cob becomes warm or cools down, slice off the corn kernels from the cob. be careful while slicing the kernels. you will need 1 cup corn kernels. now add 3/4 cup of the steamed corn kernels in a grinder or blender. grind to a smooth paste. if required you can add 1 to 2 tablespoons water while grinding. keep the ground corn paste aside. the remaining 1/4 cup corn we need to add while serving the corn soup. heat 1 tablespoon oil in a pan or kadai. add the tej patta and saute for 1 to 2 seconds. then add 1/4 cup sliced spring onion whites. instead of spring onion, you can even use one small onion. then add 1/4 tsp ginger-garlic paste and saute till the raw aroma of ginger-garlic goes away. now add the corn paste and saute for a minute. then add 3 cups water. i used veg stock, so i added 1 cup veg stock + 2 cups water. if you have veg stock, then you can even add 3 cups of veg stock. if you do not have veg stock, then just add water. mix and stir very well. there should be no lumps. break the lumps if any with the spoon. and 1/8 tsp red chilli powder (lal mirch powder) or about a pinch or two of red chilli powder. stir and mix the spices with the shorba. now simmer the makai ka shorba on a low to medium flame for 7 to 8 minutes without a lid. simmer till the shorba comes to a boil. add 1/4 tsp garam masala powder and switch off the flame. lastly add 1 tablespoon chopped spring onion greens. if not using spring onion greens, then you can add 1 tablespoon chopped coriander leaves. serve makai ka shorba hot garnished with finely chopped coriander leaves and 1/4 cup corn kernels. add some of the corn kernels in the shorba while serving.